My mistake… – …STILL CRAZY AFTER ALL THESE YEARS! I guess most everybody in town would know about it, considering that there will be so many people there every morning and past 10.00 a.m., the beef noodles would have been all sold out. It’s just round the corner from my house but I do not drop by that frequently these days as unless I go very early, it can get rather crowded and it may be difficult to find a seat…plus another reason that I will reveal later in this post. …goes a long way back. She was around at this location in the early 90’s when my girl was just a toddler and we would stop by there regularly as she loved the soup – she would finish all/most of it and no prize for guessing who ate all/most of the beef and the noodles…and even after the lady had moved here, we would still drop by time and time again. – her kampua noodles and beef soup set. …which goes absolutely well with the beef and if one adds a bit to the noodles, it certainly would bring it to a whole new level. Very nice indeed! …I thought. Gosh! The very small bowl with just a few meatballs that I had here was already RM2.00, mind you! Pretty sure that she had made a mistake and assuming that the RM5.00 was just for the noodles and soup, I went to ask if she had charged me for the drink…but yes, it was RM1.50 a glass and RM3.50 for the noodles and the soup, making a total of RM5.00 altogether and the mistake was mine, all mine. It was getting busier by then and yes, she was getting crankier unlike when I first got there when there were not so many people and she was very chatty, asking about my daughter and why I would not go on conducting English tuition classes and what not…and she did not seem very happy at all that I went to ask (or maybe she just assumed that I was going to complain that I was shortchanged)…and as a matter of fact, that’s the other reason why I have avoided this place during “peak hours” – one might be in danger of being snapped at as chances are she would be in one of her foul moods but I guess old folks like us reserve the right to be grumpy, no? I have to admit that my patience would be wearing somewhat thin too sometimes especially when I need to cope with a lot of things at hand. Well, lesson learnt, next time if I feel that I’ve been under-charged, just leave…quietly. Don’t ask! Love your honesty although you made a mistake! What goes around comes around. I do appreciate the fact that people doing a decent business, and every cent counts. Indeed! Have not seen you around for a long time now. that’s very very cheap! value for money, with drinks soup, noodles and meat, only RM5?! At her tone and volume when she snapped, I did not want to say much more – best to just leave quietly, and a lot wiser but yes, I would say it was very cheap, much cheaper than elsewhere…even here in this little town. on 2nd thought, don’t tell her you’re undercharged, or the next time you’re there it will be RM8 instead of 5! I did tell her – I started off by asking if I had paid for the drink…and said she gave me RM15 change for my RM20 note so I thought she had not collected the money for the drink. It varies from place to place – some, they will collect all and others, the drinks people will collect for the drinks…and the noodles people for the noodles themselves. So if I had not paid for the drink, I would have to pay the people running the coffee shop – that was why I asked. I remember once, at a grocery store/mini-supermarket round the corner from my house. I paid RM50 but was given change for only RM10, only to realise it as I was walking home. I went back to ask – you should see the look on the boss’ face…and he went looking for all the cash register receipts on the floor, did not know what he was looking for and he took quite a while actually…and he eventually gave me back the change, looking very very very unhappy. I was a regular customer, going there so very often to buy everything I needed. Prior to this, the boss and his wife were very nice – always smiling, said nice things and all that. So put off by it. I still go back there once in a while as it is near my house but not if I can help it. RM3.50 for the noodles & soup, a very good deal. 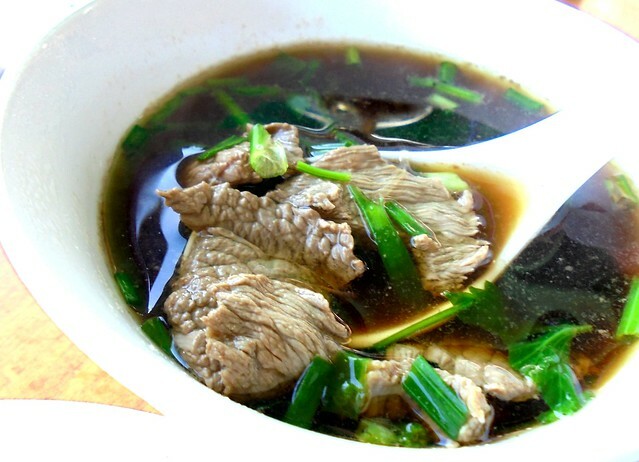 The broth looks very thick.Most kopitiam over here practise pay when food/drink is served. Yes, I did that. Just that later, I thought they had not charged me for the drink…seeing that it was so very cheap. I have a confession to make.. Errr if I’m undercharged, normally I’d keep quiet, depending on the difference la.. If too much, I’d voice out, I’m a nice person.. hehe..
Have to – people are working hard to run a decent business. May not be much but sikit sikit jadi bukit and besides, it is part of being a nice person. Little things may mean a lot. On the other hand, it does not hurt one bit for those people in business to be nice too – that’s what would get people coming back for more, good PR. Anyway, I do believe that what goes around comes around – be nice to people, nice things will come to you. Karma! Ssshhh. I always did that if I feel under-charged. They made mistakes, not me. Lol. Haiyor!!! Cannot lah. But most times, I would not know – usually I would just put the change in my pocket – overcharged or undercharged, I also don’t know. Very easy for people to cheat me lah. This case, I checked…as I wanted to mention the price(s) in my blogpost. I wouldn’t know if I’m under or overcharged as I usually can’t remember the prices….LOL! Plus, I have this habit of not looking at my change. 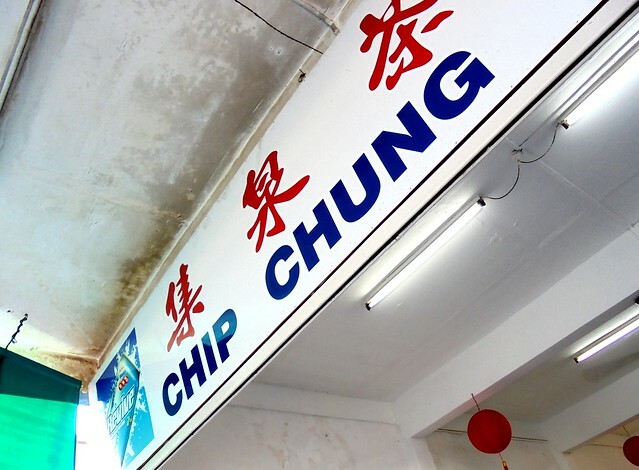 You’ll find it hard to get by here then – they all speak Mandarin. I speak Hokkien but these days, I’ve been forced to pick up Mandarin as well and I would say I am coping very well. You did the right thing. Usually people would only make noise if they are overcharged. I want to learn making my own Kampua Noodles. My mother in-law just gave me the noodles yesterday. Hoping my first attempt will turn into nice Kampua Noodles. Nervous indah. ahaha. 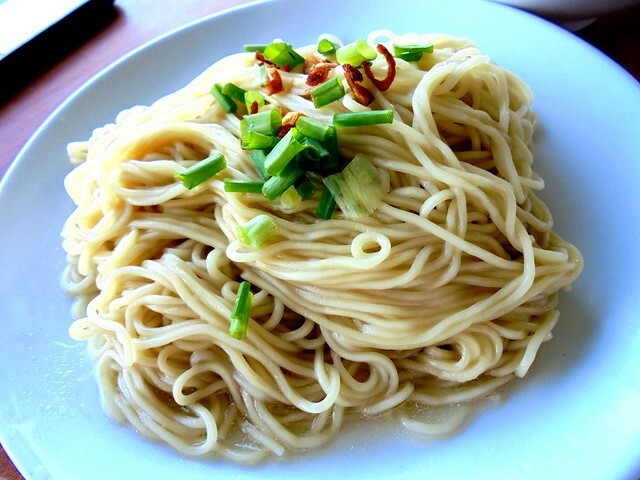 Very easy, just fry a bit of sliced shallot in a bit of oil…and use the fragrant oil to toss the noodles. Add a pinch of msg and light (or dark) soy sauce to the oil and if you have spring onions, can chop some and add too. 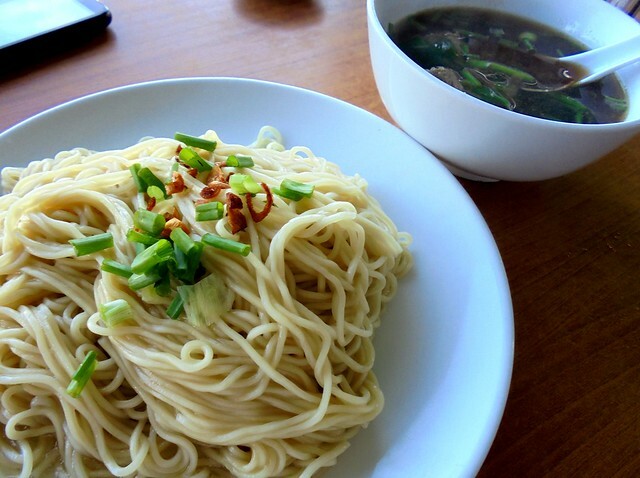 Boil the noodles, drain well…and toss well in the oil – then eat. 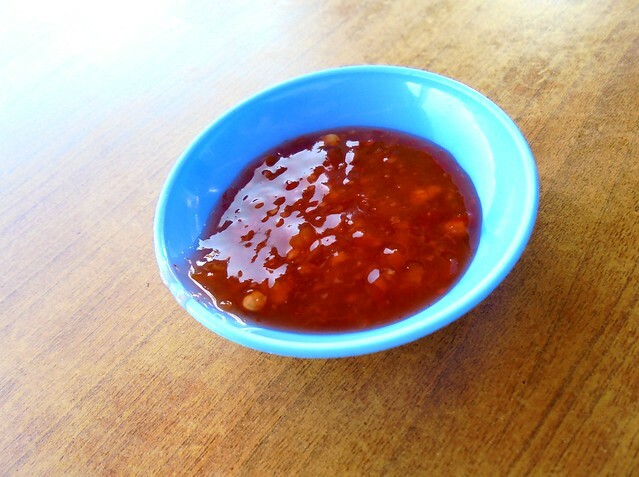 Can add meat slices if you wish…and can eat with chili sauce also if you like it a bit spicy. Here’s how I do it…but with Bovril. You can just use soy sauce. Come, come…very cheap wor…less than SGD1.50, including the noodles. Hehehehehe!!!! RM5 is cheap! I went to visit my secondary school recently, their cafeteria prices are higher than that. I went to private school but RM7+ at the school cafeteria is ridiculous, used to be around RM1 when i was a student. In KL. 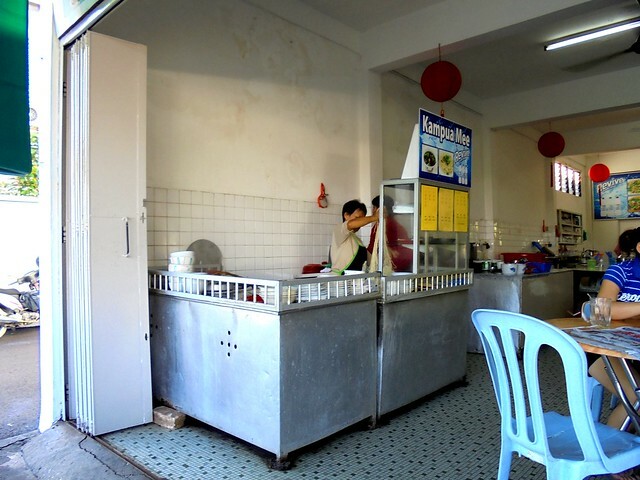 I was in BB Boys for a month – the cafeteria was like a hawker centre or food court. So many stalls selling so many different things. Nice…but same prices as outside, more or less, not cheaper – but ample choices and all tasted great. Maybe the rent they pay is the same as outside, I wouldn’t know. Maybe that’s why SAHMs pack food from home for their kids to bring to school, so expensive to eat there. I think rm7 is more expensive than normal schools, as the school has started using Ben’s Grocer [expensive supermarket for foreigners] as the caterer! We used to have a local caterer and you could have lunch for Rm1 less if you weren’t a big eater! Wowwwww!!!! Classy! I wonder what school that is. I would think kids these days would love that – they’re more used to such things, the kind of upbringing these days, they’d get to eat such stuff all the time – wouldn’t want the kind of canteen food we had in our days…or my days. …or do that when she’s very busy and is not in the mood. I’m sure no matter what happens, you always keep your chin up. Nice noodles though, so saliva-inducing. Yes, life goes on. Just avoid the place and the lady during “peak hours”. Ok la…… even middle age men like me also grumpy when stress …….. normal. Yes, young people too. They blame it on STRESS. Ya, so very cheap by Singapore standard – less than SGD1.50. Ya, I guess she snaps at everybody when she’s in a foul mood so she would not remember who, what and when. Pingback: Different but the same… – …STILL CRAZY AFTER ALL THESE YEARS! Pingback: Not what you think… – …STILL CRAZY AFTER ALL THESE YEARS! Pingback: Call me names… – …STILL CRAZY AFTER ALL THESE YEARS!